Stefan Kiessling's 70th minute header against Hoffenheim goes into the side netting but referee Felix Brych awarded a goal in their 2-1 away win. Kiessling clearly has mixed feelings as he is congratulated by teammates after the controversial award of the goal. 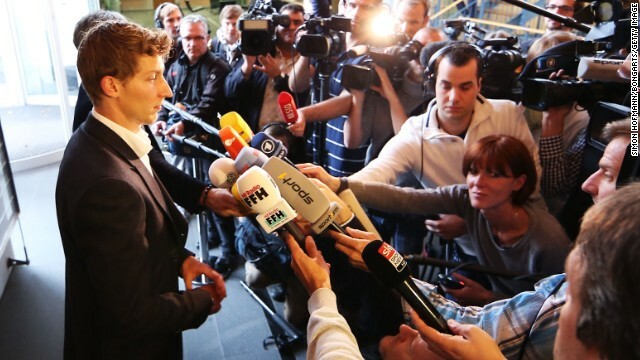 Kiessling is surrounded by the media after giving evidence to the DFP tribunal into his 'ghost' goal against Hoffenheim. It ruled the result would stand. 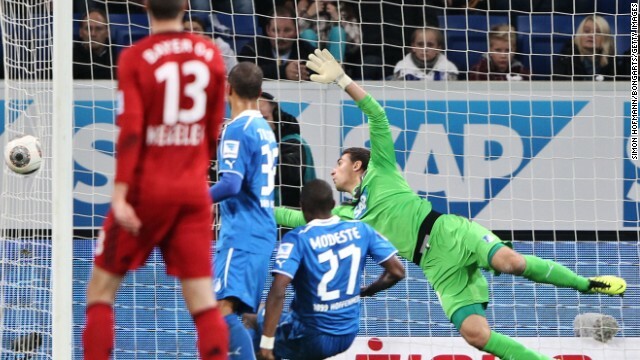 (CNN) -- Hoffenheim have failed in their bid to get their 2-1 Bundesliga home defeat to Bayer Leverkusen replayed despite the controversial 'ghost' goal scored by visiting striker Stefan Kiessling. The German Football Association (DFB) said Monday the result would stand but have given Hoffenheim one week to appeal the decision. High flying Leverkusen were winning the ninth round match on October 18 by a single goal in the 70th minute when Kiessling headed a corner just wide of the home goal. German international striker Kiessling was seen with his head in his hands, apparently acknowledging a bad miss, but the ball found its way into the net through a hole in the side netting. It was enough to convince referee Felix Brych that the effort was legitimate and to the dismay of all concerned he awarded the goal. Leverkusen, pushing Bayern Munich and Borussia Dortmund hard at the top of the standings, eventually claimed three valuable points in a 2-1 win, but it has come at a cost. Kiessling, bidding for a regular place up front in the German international team for the World Cup in Brazil, has been subjected to much criticism and there have been renewed demands for FIFA to introduce video technology to help referees in such situations. After a 90-minute hearing in Frankfurt, the head of the DFB tribunal, Judge Hans E. Lorenz said they had been left with "no alternative" but to uphold the original result. "The question isn't whether this judgment satisfies us from a sporting perspective," he said in a statement on the DBF website. "From a legal point of view, there is no alternative. There are no grounds for the appeal. The factual decision may have been incorrect, but it is irrevocable." Hoffenheim cited an incident in a match between Bayern and Nuremberg in 1994 when Bayern's Thomas Helmer scored a similar 'ghost' goal in a 2-1 win. That game was replayed and Bavarian giants Bayern cruised to a 5-0 win. Bayer Leverkusen are tied on points with Dortmund after a 2-1 win over Augsburg at the weekend, a point behind reigning champions Bayern, while Hoffenheim remain in mid table. Kiessling has six goals for the season, including his effort against Hoffenheim, one behind the leading tally.